Now, we're ready for more updates, after three years of ignoring your customers! To developer: And no, fixing the shell while providing no new content isn't "update". It's "squeeze more money out without giving anything in return". Also, your response is facetious, unless you've somehow squeezed in all of the recipes of the world. Now, we're ready for more updates, after three years of ignoring your customers! To developer: And no, fixing the shell while providing no new content isn't "update". It's "squeeze more money out without giving anything in return". This cookbook strikes an excellent balance between simplicity and discovery. Countless times it has provided easy recipes to do with what is on hand. When called upon to provide something that will impress a more discriminating taste, it delivers. A good investment. Easy informative...both the program and recipes. I have been using the cookbook “How to Cook Everything” religiously for years. I was really happy to see this app and have been really pleased with its layout, recipes, tips, and tools. Great app! Tons of stuff in here and recipes, etcetera. I was actually just looking for an app that lists food temperatures because I never remember how long to cook fish and beef. Now I will have to look for that in this app. Also, I have trouble with meat thermometers. Sometimes I just use my judgement which is good. But I like to have a little help. Thanks! i bought the normal and the vegetarian versions. waste of money and totally wrong recipes. follow the recipe for hard boiled eggs and you wind up with a gooey runny mess when you crack them open. the vegetarian version has nothing the regular doesn't have. ok they got my $20 and i'm the fool. Are you going to update the app to work well with the new version of iOS? Love it, looking forward to the promised update. Works great so far. I'm getting warnings from iOS, so I'm glad to hear an update is coming. Great app, but it will be barred from the App Store soon. So glad I spent $10 on an app that doesn't even work with current operating systems. I use this app weekly and love it. Please update soon. I paid for this app along with the partner vegetarian version. I'd like to continue using them. This is my go-to app for easy-to-make recipes. Unfortunately, it seems it is not being updated and the featured recipes has not changed for more than a year. This app is a bit of a strange beast. The recipes are fantastic and I've enjoyed almost all the food I've made. I'm not sure how long I'll be able to use it as the app is not updated to the current iOS. Developer needs to get a move on. There's so much good information in this app, but it's not fully compatible with modern iOS. Avoid purchasing this. Apparently the developer and Mr. Bittman cannot be troubled to update this app. They have your money so why bother. It's really a shame because there's so much value in this app. The information I've saved herein will soon be lost. With iOS 10.3 Apple confirms how old this app is. It won't work with iOS 11. I guess Mr Bittman is happy since he got you money already. I suggest he stick to paper books in the future. My go to cookbook. I'm glad it is getting an update for the new iOS. The point of buying a standalone app is so that it can continue to update. 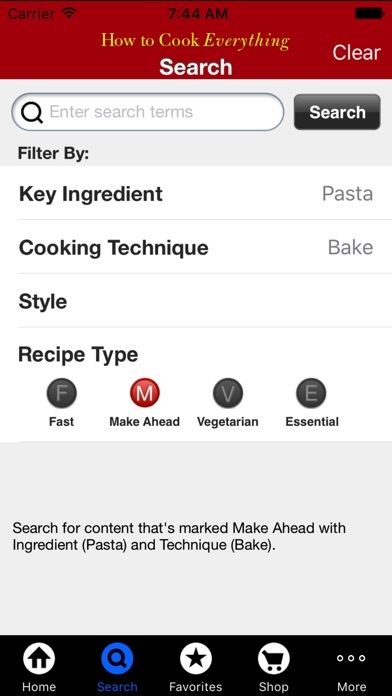 This app not only hasn't had a single recipe update in 3 years, making it basically an ebooks and not an app, but now it's so out of date that it will no longer work in iOS. It took bad reviews for the developers to realize this. I would recommend buying the ebook version or just skipping it all together and spending your money on apps that evolve and continue to provide updates to their users. Hasn't been updated in more than three years (Jan'14 to Apr'17) and soon won't work anymore. Content and info remain good, but hope they'll keep it available. Notes do not save. Anything written in the Notes section of the recipe is lost as soon as I leave if for another page. Arrgggg! Recipes are delicious. And clear. Timers built into the app. Lots of variations on most basic recipes. I love the format. Edit 2017: The app is still excellent, but my phone has taken to informing me that it will not be compatible with future iOS updates. I hope the developers will take note of this. I've pretty much depended on this app for the last year. It's been excellent for me as a newbie cook/baker often intimidated by the jargon and preparations on more advanced or specialized websites. Every recipe is perfection! Bought my first copy the day it was released! Please upgrade for iOS so I can continue to use them on my iPhone! I use this app regularly and am so relieved it will be updated to work with IOS11. I was so worried I would be without it. For me it is the best recipe/cooking app ever!! I've used this app for several years and like the recipes and helps! Please update before the release of iOS 11. I love this app. Will this be compatible with ios11? Please! I use this app all of the time. The recipes are simple and yield fantastic dashes. It is also handy to use when I come across fresh vegetables on sale and want to find a new way to cook them. I love this app. Use it all the time. When will you update it? You've been saying for years you will. So, when? Stay away from this app. They don't seem to care. Great app with great recipes, but STILL needs to be updated (despite what the Feb review says). How long does a compatibility update take? Great app, but needs update to latest iOS. It seems as if it should be quite useful, but I tend to turn to Google Search for inspiration (i.e., what can I do with ingredient X? Or what goes with ingredient Y?). Yet, I have not deleted it from my phone. Great app, but needs updating. Your app may not be usable in future Apple updates can you please update your app. Love 💓 this app don't want to lose it! Has ideas for cooking everything and includes variations and timers. My only worry now is that I'm getting that warning that it won't work with future iOS software. Hope they update soon. Hey, it's really frustrating that there isn't an update for this app unless you spend another $10 to get the vegetarian version. NOT FAIR. I love the app, for which I paid my $5, but come on!!! I use this app a lot. I wouldn't change a thing. I like the concept of giving basic recipes that can be added to to suit taste preferences. So disappointed that Marc Bittman has not upgraded this app. What more can I say. I'll check this book first then maybe Google or or another book. Good easy recipes. Easy to follow. Did an angel food cake tonight--easiest recipe I've found and a really good cake. I love this app. Instead of going to the web, I can find what I'm looking for. Love the layout with a bit of info, the ingredient list (which gives you the option of switching out ingredients), and the step by step instructions. Instead of scrolling up and down the page or flipping back and forth, I can click on the tab. Genius. Now, if they would just update it so I stop getting the notifications about the need for an update. Although the app works fine, every time that I use it a warning appears that there may be compatibility issues if the developers do not update. That's the reason for 3 stars instead of 5. 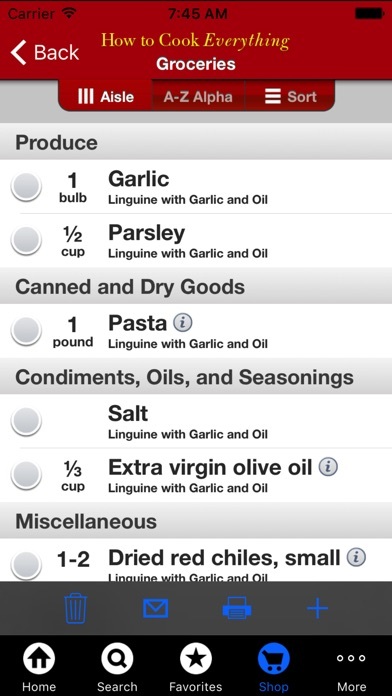 The best cooking recipe app I have seen. 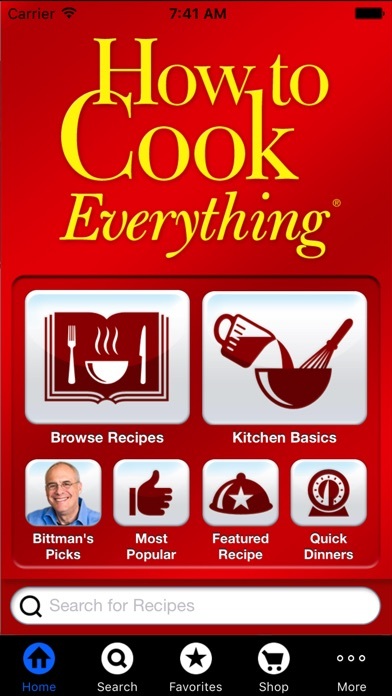 Bravo Bittman! Edit: it currently says this app won't function when iOS 11 is the new operating system. Please update this asap so it can function. I spent good money on this, please do your part by keeping the app functional. Good to finally see an update for compatibility with iOS 11. App still does not seem to support Retina screen resolutions, or Plus device screen sizes. I used a few of the recipes and they’ve turned out great. Also great to use just for reference. Good “how to” explanations and I like that they include variations. Good job with updating to iOS 11, but why not 64bit too? Love the book. The app adds convenience. But please please please actually update the app UI. This would be a 5 star review for content and I will update accordingly when they do. Good job with updating to iOS 11, but why not 64bit too? Love the book. The app adds convenience. But please please please actually update the app UI. The app needs updating to be in line with iOS design guidelines from the past three years. The keyboards are way big on my iPhone 7 Plus. Mark Bittman is the best! This app is a reliable go-to for everything. I am a darn good cook. Now. 12? years ago when I got the book and 4? 5? years ago when I got this app, not so much. I trust Mark Bittman, no doubts. His advice is virtually always true. And bonus: If I have purchased a random item that looked good at the store / framers market, I can look up a great yet simple recipe on how to cook it. Makes the unknown easy! I have never written a review online. Ever. This app has been a life saver in preparing meals. I've even impressed my wife who is an extraordinary chef in our kitchen. Loved the app until it stopped working with the new iOS. Terrible for something I paid for. This app has been abandoned. Thanks, Bittman. Nothing yet as of 15 June... I spoke too soon. My bad. On my iPad mini, it looks and acts the same as before, but no more iOS 11 alerts. I've always had great success with his recipes and techniques, this is a gem of an app. It tells you not only what to cook, but how to cook it, providing an encyclopedia of ingredients and detailed instructions on specific cooking techniques. Thanks for updating the cookbook so I can continue using! Best place to start cooking right here. One of my favorite features is the shopping list. I can make a master list for each store then mark what I need that week; then I unmark each item as I toss it in my cart. Love it! New update is broken in 9.3.5. I open the app and it crashes on startup. Please fix. I have reinstalled with no luck. Please fix this crashing! Provides both recipes and tips for many foods. Worth every penny! What happened to the third App in this series? It was a nice addition, not cheap, and should be updated to work on the latest operating system. FYI, all developers are in the same boat, your customers should not need to beg. Developer, please respond. Needs to be updated for iPhone X and up but other than that it’s great. This app has been updated with 64 bit support but doesn't run at the newer screen sizes. On my iPhone 6S it is a scaled up app. I'm glad the app will work with iOS 11 but the developers should really bring it fully up to date. 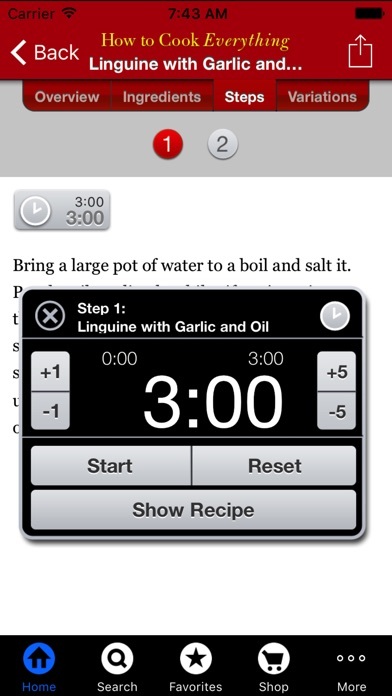 Old, old review (two versions ago, from 2015 IIRC): This app has fantastic recipes. But it was never updated for post the post-iOS 7 user interface style not adjusted for the iPhone 6 screen size. I realize this app is one done by a company that licensed the book's content, but this is disappointing. Again, fantastic recipes—I'm reviewing the presentation layer here. Finally an update for the future iOS 11. One of my favorite apps and I was getting tired of the update notifications. Yea, I have the hardbound books also. This app hasn't been updated in years. Buy the book if the developer isn't going to do their job and update this app. Glad this app got an update. It was much needed. And, for someone that doesn't cook very often this is a life saver! I have notifications turned on to let me know when a new recipe is available. But not received anew recipe in what seems like forever. Why? Also, keep getting the message that there needs to be an update! Doesn't anyone read these? I became a fan of Mark Bittman watching him on the Today show over the years. I am a cook and I love to travel. I recently spent almost 3 years traveling in Asia and would use this app to help me cook food I didn't know or how to cook or stuff I would normally cook in an oven but usually there wasn't an oven available. I got this app years ago when it was free though so I don't mind any lack of updates. Easy and a great reference. I really like this app, but the same 3 recipes have been featured for several months now, if not the last year or so. The last update was done in 2014. Really hate to think I spent money on this, and they dropped the ball and quit supporting the app. Start putting new recipes in, I wasted money on this app for, what, like 10 recipes. Guess once you get people's money, you could care less after that. Just got a new recipe notification today! Changed my review to five stars. Thank You! I was a little bummed that with the new update I could not use the app that I paid for five years ago. So now I have paid for this twice. Also, where is the holiday menus? 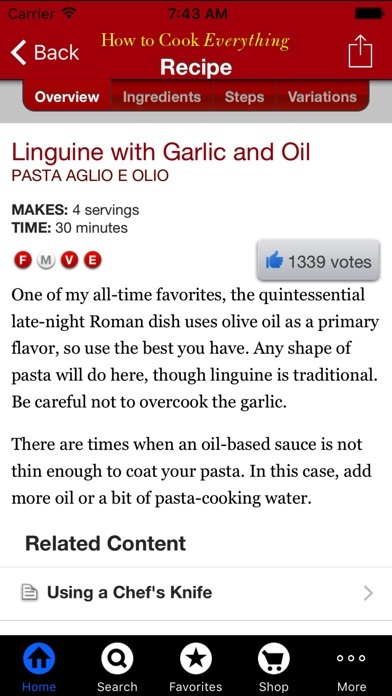 Otherwise, I would give a better rating because I love the recipes. Good job with updating to iOS 11 but it definitely needs a full UI update. Love the book. The app adds convenience. But please please please actually update the app UI. This would be a 5 star review for content and I will update accordingly when they do. Edit: Thanks for the clarification about 64bit, for that I'll add a star. I look forward to the update. I'm a terrible cook but even I can follow most of these recipes. The app is so helpful and easy to use! I am glad you updated this, I used it every day, but was there no way for you to keep my favorites? Simply: if you don't know how to cook, this will get you started. Especially if you don't know how to boil water, you will find an actual recipe for that here! If you do know how to cook, this will help you move to a new level of understanding and experimentation. Almost never think of an idea for a recipe that this doesn't have already. Different cuisines and different styles of cooking. This app has you covered. Needs to bring it fully updated to support newer devices. This company released a new version of this app (the exact same cookbook) and will not support the old version, forcing their customers to pay to download the app a 2nd time. What’s to stop them from doing this again? Don’t purchase this app until they change their bad business practices. It’s unfortunate that i can’t leave a review for the vegetarian app, which I bought and paid for several years ago. Apparently the creators decided to eliminate that version and make everyone repurchase the app for more money. Since I’ve also purchased the book, paying for the app once was enough for me. I’ll make do with other apps. Think twice before paying money for something they may decide is obsolete. I used this for years until the app stopped being compatible with iOS updates. Finally had to re-purchase it. It’s an excellent app, but I’m displeased at having to pay for it again to access it. It is nice to have a lot of receipts at your finger tips! This is a very resourceful app! Total waste of money. App is never updated and runs like crap and recipes have been stagnant forever. Tons of great recipes, as per the Bittman norm, but the way they have been bundled with technique assistance, search functionality, etc, is incredible. I've never regretted buying this app.